NOTE: Since this article was originally published, the discussion of PRT headways and capacity in the section "Constrained line capacity" has been slightly expanded. Personal Rapid Transit, or PRT, has once again emerged from obscurity to be asserted as an alternative to standard rail transit projects in various cities, such as Cincinnati, Austin, Minneapolis, Duluth, San Jose, and Santa Cruz. 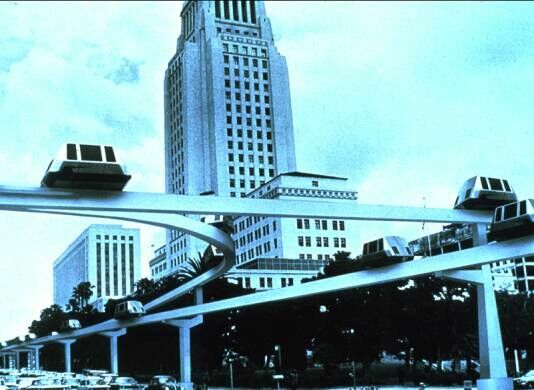 A transit concept from the 1960s, envisioning tiny automated electric automobile-like vehicles speeding throughout urban neighborhoods on elevated guideways, Personal Rapid Transit has fallen on its face and seemingly died several times, only to be repeatedly resuscitated by its adherents. Despite the persistent and fervent claims of its promoters, repeated attempts to implement a working PRT system, even in very small-scale scenarios, have invariably failed. Not a single PRT plan, during these promotional efforts over the past 40 years or more, has seen successful implementation even in a small test application, much less a major, heavy-duty, citywide rapid transit application. 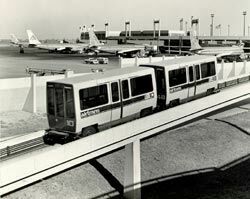 Early would-be PRT installations, such as the AirTrans system at Dallas-Ft. Worth Regional Airport, and the PRT at West Virginia University at Morgantown, eschewed any attempt to provide true PRT-style, small-vehicle, customized origin-destination service, and were implemented in effect as line-haul automated guideway transit (AGT) peoplemover systems with some innovative features (such as offline stations). Bona fide Personal Rapid Transit seems to work perfectly in the theoretical cyberspace realms hypothesized in the computer simulations of its promoters. The basic idea of PRT is to try to replicate the personal vehicle – or something like a small taxi – in an automated, public transit mode. When the concept was being aggressively pushed by the federal government in the early 1970s, Metropolitan magazine (Jan./Feb. 1972) explained that PRT vehicles "are designed to provide the security and privacy not usually found in larger more common transit vehicles" (i.e., you don't have to ride with "those people"), and they would "provide passengers with a single trip, much like taxi service." A network of dedicated, elevated guideways would carry automatically controlled, electrically powered, small, driverless, personal vehicles – often resembling pods or canisters, and sometimes tiny autos or enclosed golf cart-like cars. 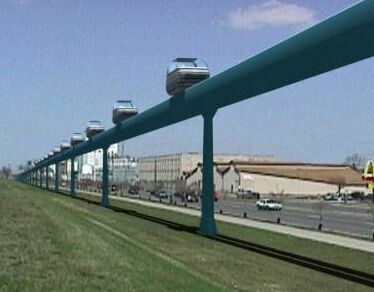 These would be controlled and routed by a sophisticated computer system, through the aerial guideway system, from an originating elevated station to a destination elevated station. These stations would be placed off the mainline of the guideway, so that the little vehicles could access the station and deboard or board passengers without stopping other PRT traffic zipping by on the main guideway. The theory of the PRT approach is that users can be custom-routed from where they are, to precisely where they need to go. A passenger would just summon a personal robot pod (vehicle) and have it routed straight to his or her destination. Thus, the concept requires a relatively vast network of guideways and stations permeating an urban area. An example of just a section of a map for a proposed PRT network is illustrated below. A conceptual map of a PRT system. Personal Rapid Transit concept requires dense penetration of neighborhoods and commercial areas with a labyrinth of elevated guideways and stations. However, according to its promoters, this extensive guideway network would be affordable, because PRT supposedly would be dirt-cheap compared to more "conventional" transit modes, like light rail transit (LRT). The lightweight little cars (in many designs, using variants of automotive technology) would almost surely cost less than heavier, fullsize railcars. More importantly, the elevated guideways would supposedly be much cheaper because they wouldn't have to support as much weight. Furthermore, the little elevated stations would be expected to be smaller and significantly cheaper. As a result, Personal Rapid Transit proponents usually conjure visions of an extensive web of slender guideways and Lilliputian PRT stations weaving through neighborhoods and activity centers, and even penetrating offices and apartment highrises. Likewise, PRT promoters predict amazingly low operating costs, mainly because of automated, driverless operation. This is combined with optimistic fare revenue assumptions to produce claims that PRT systems will produce an operating surplus and pay the costs of their installation. So much for the theory. Reality provides a far gloomier, and perhaps even devastating, assessment of the feasibility of the Personal Rapid Transit concept. One major environmental problem with PRT is the barrage of visual obstruction which would be produced by dozens (perhaps hundreds) of miles/kilometers of elevated guideways and dozens or hundreds of overhead stations – each with at least one long, additional access track to connect the offline station and its incoming and outgoing cars with the main guideway. PRT designers propose an aerial web of guideways between a quarter and a half-mile apart, with stations about every 1/4 to 1/6 mile. The effect would be to create a dense forest of concrete and steel support piers and aerial structures, meandering and cris-crossing throughout the urban environment. Any elevated urban transit system incurs special problems in actual operation since it is situated above the ongoing activities below. Personal Rapid Transit promoters portray a system of slender, unencumbered overhead guideways, with little cars speeding smoothly to their destinations. But any complex system is subject to glitches and breakdowns. And any outdoor, heavily used system is particularly vulnerable to mishaps, even if caused only by weather conditions. Snow and ice accumulation, rain, and other conditions can affect or interrupt service. How would passengers extricate themselves from their little cars and guideways? More and more, fire departments and other emergency service providers are requiring elevated guideway systems, such as monorails, to be equipped with emergency evacuation walkways, wide enough for wheelchairs. Such walkways would undoubtedly enlarge the profile of PRT guideway structures, increasing the impact of visual intrusion. 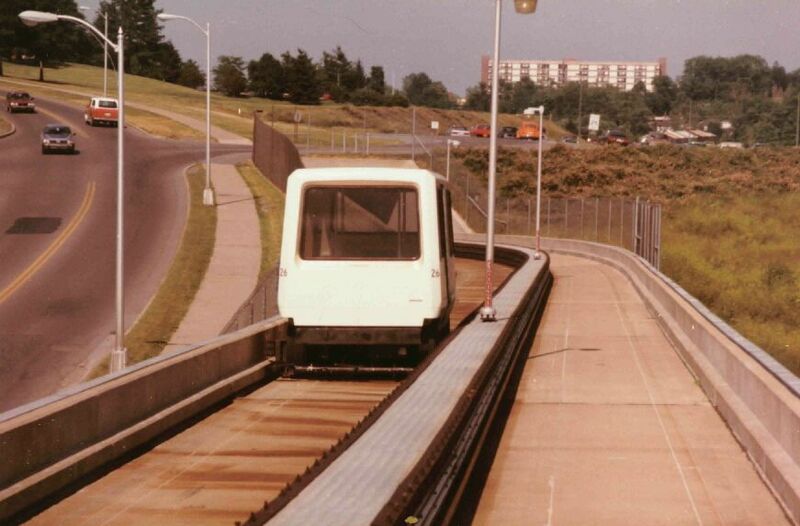 Another problem facing Personal Rapid Transit systems is what might be called "system droppings" – the possibility of debris, lubricants, water, ice, or snow falling on pedestrians or vehicles below the elevated guideway ... especially when the guideway is just a slender beam straddled by the PRT vehicles. This danger has invoked the possibility of requiring drip pans beneath guideway structures especially vulnerable to this type of occurrence. Drip pans are wide, elongated pans or trays designed to catch whatever might fall from the guideway – water or lubricants; slush, ice, or snow falling off or pushed off by vehicle movements; mechanical parts or pieces which might be dropped (as has already happened in monorail systems in Seattle, Kuala Lumpur, and Las Vegas). Like evacuation walkways, safety-mandated drip pans would add to the PRT guideway's structural profile and increase visual intrusion even more. 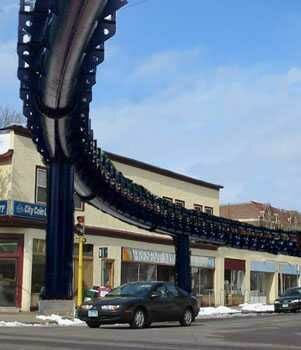 Simulation of an elevated PRT guideway for Minneapolis curving over an intersection – and this is a single-track segment, without emergency walkway or drip pan. Personal Rapid Transit stations are yet another source of visual intrusion. As noted above, PRT stations are located off the main guideway (so that cars for other destinations can bypass undesired stations), and thus require substantial additional access guideway structure to facilitate the ingress/egress of PRT cars (see station simulation, above right). This significantly increases the amount of visually intrusive elevated structure. In terms of station dimensions, PRT promoters seem to downplay the size of stations. However, the simple logistics and requirements of publicly accessible elevated structures – particularly structures designed to accommodate large volumes of tiny-vehicle traffic – dictate minimum size characteristics which are substantial. For example, ADA compliance typically requires elevators. Add in escalators for convenience and efficient public movement, plus adequate platform widths for passengers to wait safely (with room for purchasing tickets), and the spatial dimension of the elevated structure mushrooms ominously. in narrow streets and other constrained areas, the effect is to form a "lid", with the street below virtually placed in a tunnel. PRT promoters often downplay the design and visual impact of proposed stations as well as the supposedly slender, unobtrusive guideways. illustrated below is a simulation of an elevated station for a SkyTran suspended-vehicle Personal Rapid Transit system proposed for Seattle. The design appears to provide only stairway access to the vehicle boarding platform – a non-ADA-compliant feature which would be illegal in reality. Also, there are no areas to accommodate the massing of large numbers of passengers, nor to enable passengers to purchase fares. And the station is simulated in a large open plaza, not a more typical narrow street. 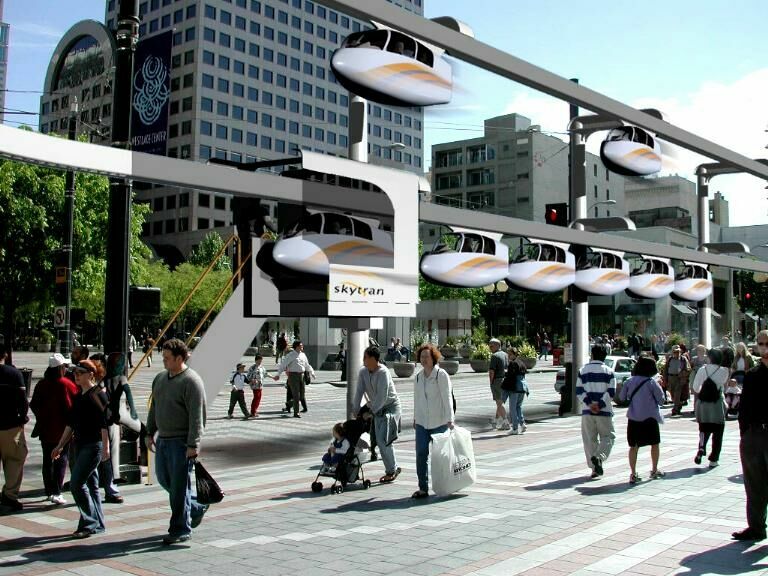 Simulation of station for SkyTran suspended-vehicle PRT system proposed for Seattle. Stairway-only access would be illegal in reality. Station is simulated in a large open plaza, not a more typical narrow street. PRT promoters often downplay design and visual impact of proposed stations. 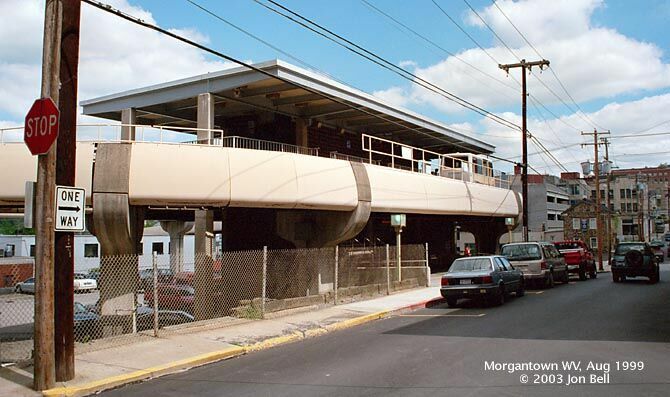 Elevated stations of the West Virginia University PRT system at Morgantown provide some idea of what an actual Personal Rapid Transit station might look like. These real-world PRT stations provide adequate boarding platform space, as well as an area for fare payment. They also provide ADA-compliant elevator access. Walnut station (downtown) of Morgantown's PRT system hints at what an actual PRT station might look like. in confined downtown corridors, it would form a "lid" over street. 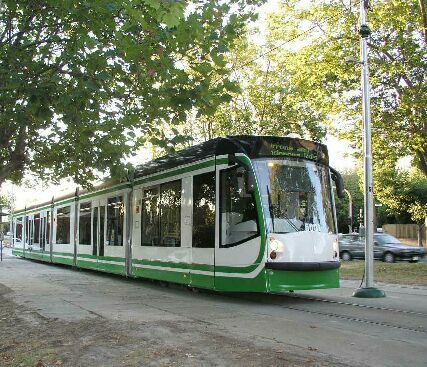 While Personal Rapid Transit is usually presented as a brandnew, emergent concept, it is far from new, and indeed has a record of (troublesome) experience which provides valuable lessons helpful to evaluating critical elements of the PRT concept today. According to Wikipedia, the online encyclopedia, "The concept is said to have originated with Don Fichter, a city transportation planner, and author of a 1964 book entitled individualized Automated Transit in the City." in fact, according to this report, PRT had its origin in military analysis: "In the late 1960s, the Aerospace Corporation, a civilian arm of the U.S. Air Force, spent substantial time and money on PRT, and performed much of the early theoretical and systems analysis." However, according to Dr. J. Edward Anderson, perhaps the foremost North American proponent of PRT, the lineage of the concept goes back even further: "The history of continuous evolution of Personal Rapid Transit (PRT) can be traced back to at least 1953." in fact, Anderson asserts that "Some of the ideas embodied in PRT go back even to the last century ...."
By the early 1970s, PRT advocates had won the attention of the federal government, which at the time was finding itself besieged by requests for new rail projects as a means of addressing the nation's burgeoning traffic-congestion problems. A National Journal article described a top-level argument (which, it predicted, would "take several years to run its course") over "whether the federal government should invest billions of dollars in available public transportation systems or stall until better systems are perfected." Federal officials in the Nixon administration of the period seized on PRT "experiments" as a way to stall, thus helping to dam, for the moment, a more massive outflow of federal funds into "conventional" urban transit projects. Reflecting the then-prevalent federal mindset, U.S. News & World Report exuberantly reported on "New ways of moving people quickly from place to place through congested areas" which were "now being put to the test." "Brightest promise for solving this problem ..." explained the magazine, citing "many transport experts", was "people movers". These were described as "small vehicles, most without drivers, that bypass conventional routes through the centers of cities." 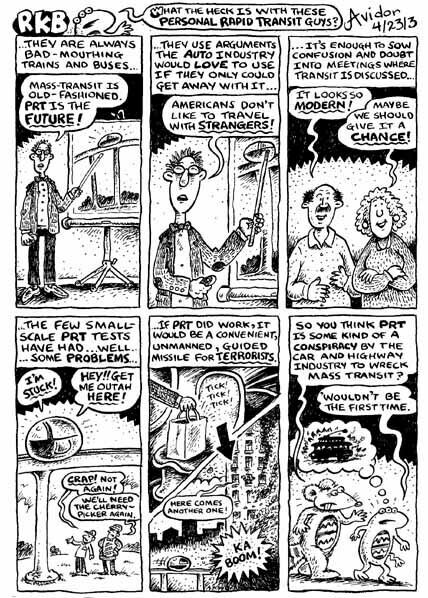 PRT was the buzzword of the mid-1960s and early 1970s, and the feds sank their teeth into it with a marketing program that included a booklet, Tomorrow's Transportation (U.S. Department of Housing & Urban Development, 1966), which extolled the concept and promised that "Small, individualized vehicles avoid chief delays present in rapid transit ...." Metropolitan magazine (Jan./Feb. 1972) explained that "With the backing of the Federal government, ... these personal rapid transit systems may prove an important factor in clearing up our streets and highways and cleaning up our air." "There's a radically different way of getting you to work, across town, or to the airport – when you want to get there" enthused Popular Science (Nov. 1971). "it's fast, comfortable, personal – and it's here now." This "new kind of intracity transportation", the magazine explained, "called Personal Rapid Transit or PRT, is being pushed – hard – by the U.S. Department of Transportation." The story then cited examples of how Washington was dolloping vast largesse into PRT projects, like the AirTrans system at the new Dallas-Ft. Worth Regional Airport, and the PRT system at West Virginia University at Morgantown. Unfortunately, all that optimism and investment in PRT had a rather catastrophic encounter with something called ... reality. One after another, the various federally funded PRT showcases either fizzled or bombed terribly, exceeding budgets, and exhibiting an array of unforeseen technical problems – some of which seemed to be inherent in the concept. The problems of visual intrusion, evacuation facilities, and the like seem peripheral and minor compared with the truly critical drawbacks of Personal Rapid Transit, demonstrated in actual practice: the relatively minuscule capacity of the system, with its tiny cars, and the implications of that in view of the relatively high installation cost of this capital-intensive, entirely grade-separated, elevated transit concept. The capacity problem has proven to be PRT's Achilles heel, time after time. PRT promoters claim extremely high capacities for PRT. SkyWeb Express (aka Taxi 2000, perhaps the USA's foremost PRT vendor wanna-be at the moment), for example, claims the capability of operating at a one-second headway (or less) and conveying as many as 10,800 passengers per hour in fully loaded 3-person vehicles. Designers even postulate operating vehicles at fractions of a second apart, yielding staggeringly high capacity rates. Leaving aside the probability that average loads would be less than full capacity, critics question the plausibility of assuming such close headways for vehicles operating at up to 40-50 mph (as the SkyWeb design assumes). At a safe stopping rate of 5 mph per second for seated passengers, it would take 8 sec for a 40-mph vehicle to come to a complete stop; safety engineering rule-of-thumb recommends assuming this as a bare minimum safe headway, and adding an additional allowance as a safety margin, depending on the given mode and application. Given the many variables involved – including response time for the automated system to detect an obstacle ahead of a car, weather conditions impacting guideway adhesion, etc. – at least doubling the "bare minimum" stopping time would seem reasonable to provide an adequate margin of safety. This implies a minimum safe design headway of 16 seconds, and thus about 1/16th the line-throughput capacity claimed. (The Morgantown "PRT" system – in reality, as previously noted, a type of AGT – has minimum headways of 15 sec.) This level of headway would also make more feasible the assumed accommodation of vehicles frequently entering the guideway from offline stations. Using this more realistic headway, and a more realistic average occupancy of half the vehicle capacity, one can calculate that the probable guideway capacity is more like 340 persons per hour – less than half the capacity of a vehicular traffic lane, and less than 8% of the capacity of a surface LRT system running 2-car trains. Even the "bare minimum" 8-second headway, sans safety margin, would imply a capacity of only about 680 persons per hour – about 15% of surface LRT. Some public transit planners calculate minimum stopping time from the stopping distance. On this basis, the stopping distance is 235 feet (71 m), and the stopping time from 40 mph is 4 seconds – doubling this to incorporate a safety factor yields a possible PRT minimum headway of 8 seconds. However, it is also appropriate to use a more realistic probable occupancy of 1.2, closer to that of the private automobile in urban travel, which PRT promoters claim to emulate. This implies a maximum line capacity of about 540 persons per hour – still slightly below that of an arterial lane, and far below the potential capacity of LRT. The specific PRT technology of various vendors, vehicle branching and merging spatial allowances, and other considerations could further impact the minimum safe headway. 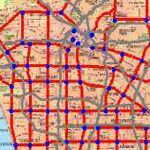 It should be noted that some PRT proponents argue that their computer simulations of Personal Rapid Transit operation assure them that redundancy and other safeguards in the system would prevent collisions and virtually guarantee perfection in system operations. Aside from the fact that the assumption of de facto perfection seems foolhardy in any system transporting human passengers at high speeds, it must be pointed out that there is no evidence from actual experience that such "zero-tolerance" running of totally automatic passenger cars at fractional headways is truly free of any reasonable possibility of accidents. In effect, PRT theoreticians' claims on the headway issue appear to be based entirely on speculation. But Personal Rapid Transit station logistics present an even more formidable constraint to PRT operations and capacity. According to PRT marketers, a major advantage of Personal Rapid Transit is the almost total elimination of passengers' waiting time – cars supposedly would always be queued up in the stations, ready to depart (or else flitting about empty on the guideway system). And there would invariably be enough little cars at every station to accommodate crowds of riders. As soon as they arrive at the PRT platform, passengers would merely board the first car in line, which would then leave the station, followed by the next in line, and so forth. One of the problems with this and other PRT design assumptions is a near-total disconnect with the realities of human group dynamics and transit passenger behavior (probably a reflection of the isolation of PRT theoreticians from involvement in the public transport industry). Even a cursory consideration of common logistical issues reveals the inherent problems of any small-vehicle system. Simulation of a PRT station works perfectly in cyberspace – but the small passenger volumes assumed for the little pods are disconnected from the surges of passenger flows which occur in reality. Typically, at the height of peak hour in a major urban area, it is not uncommon for perhaps 200-300 people to crowd onto transit platforms, often arriving right after clock-out time. (And that's a modest peak surge – several times that volume may be occasionally experienced in unusual conditions, such as during holiday shopping periods, major recreational events, etc.) According to PRT marketers, passenger demand can be readily handled simply by increasing the number of PRT vehicle "berths" in the station. In reality, 200 people would probably not fit so neatly into 50 cars, since many would be selecting different destinations, many would choose not to ride with strangers, etc. Thus perhaps 75-100 cars would be realistic for such a peak passenger demand, in adherence to the PRT "customized service" concept. Thus, to meet a peak surge of 200 passengers, a platform 750 to 1,000 feet long would probably be required to fulfill the claims of PRT promoters on this basis alone (more on that below). But how expeditiously would a string of 75 to 100 tiny PRT cars be in moving a large peak load of passengers out of the (not-so-little-anymore) PRT station? One can realistically assume that it would take about 20 seconds to board each little car (passengers climbing in one after the other). Even if one assumes all (waiting) 75 cars could be boarded at once, and this could be accomplished within the 2 to 10 seconds claimed by PRT designers, that still implies an average 6-sec delay just for boarding. However, it is unlikely that, in actual practice, boarding would be so smooth and simultaneous. As any experienced public transit operations employee knows, there are all kinds of snags: passengers will hold doors for their companions; elderly passengers take more time, especially climbing into a little pod rather than stepping through a wide train door; wheelchair passengers take time maneuvering their chairs and attaching tiedowns; passengers with baby strollers, bicycles, etc. need more time. All these kinds of delays would occur randomly along the line of tiny cars waiting to depart, further bollixing efficient station throughput. The outgoing vehicles, of course, would confront the problem of merging from the departure track into the steady flow of cars on the main guideway. While this might well affect running speeds on the main guideway, possibly creating bunching and backups of little cars, it is not the most daunting problem facing the concept. There is another, much more formidable logistical issue – all the additional PRT cars which need to get into the station, to deboard passengers who are coming to this destination, and to handle the next surge of passengers wanting to board their own little PRT pods and leave. These cars need to diverge from the main track and enter the same station. First, it's obvious that much more than a 750 to 1,000-ft.-long station is required, since a deceleration track is undoubtedly necessary to slow down 40-mph vehicles (making a slight curve as they switch off the main guideway) before they enter the station. But this is not all. With the possibility of a departing row of cars still clogging the station at any time, it would seem that a lead-in track for arriving cars would also be needed. The required length of this deceleration/arrival holding track is debatable, but it seems apparent that it would conflict with PRT promoters' visions of stations spaced every 1/6 to 1/4 mile. Even with extensive access and holding/staging tracks, it is likely that such a system would experience queuing and traffic jams in practice, with incoming vehicles backing up the arrival track and even clogging the main guideway beyond the switch, queuing up on the main track, and forming ... a traffic jam. Meanwhile, the first battalion of little PRT cars would be trying to get out of the station exit track and onto the main line ... but perhaps a traffic jam emanating from a similar station downstream would be creating a similar blockage of the main guideway. And all the while, dozens more passengers would (presumably) continue to crowd onto the station platform, in hopes of catching a pod. Pessimistic fantasy? On the contrary, it is precisely small-vehicle traffic jams just like this which have bedeviled previous real-world attempts to implement PRT-type systems (e.g., the AirTrans system of the mid-1970s at the Dallas-Ft. Worth Regional Airport). Even with somewhat larger, van-sized vehicles, AirTrans system operators found that passenger surges would create traffic logjams, with queues of small vehicles patiently waiting to get into the relatively tiny stations, fouling the mainline guideway. AirTrans PRT at Dallas-Ft. Worth Regional Airport: Even with van-sized vehicles in 2-car trains, system experienced "traffic jams" handling peak passenger volumes. To avoid the problem of congesting the station access track and creating backups into the main guideway, and to avoid the need for bidirectional double-tracking, with the added visual intrusion, some PRT designs incorporate great loops, perhaps several city blocks wide. in addition, stations would be designed on a much smaller scale, with perhaps no more than 10-15 PRT car berths at the maximum. PRT cars unable to enter a station would be programmed to just bypass the station and keep circling round the great loops until one of the limited number of berths becomes available – taking perhaps 10-12 minutes to do so. This might serve to prevent the backups described above ... but it also certainly seems to imply some lengthy wait times for those prospective PRT passengers in the station who haven't been fortunate enough to get the first 10-15 cars, especially if their intended cars must stay in a "holding pattern" through multiple loops until appropriate berths become free. PRT concept envisions one-way loops throughout urban area. To go opposite direction, passengers must ride car "wrong way", then double back. Cars unable to enter crowded stations must stay on loops in holding patterns. Energy-efficiency, anyone? Since this procedure has never been implemented in actual real-world conditions, it is impossible to assess how well it would work in practice. One can readily speculate, however, as to how long it would take weary after-work commuters, or crowds leaving a major sports or entertainment event, to lose patience waiting for their PRT pods caught in such long holding patterns, and to simply dismiss such a system entirely in favor of returning to dependency on their private motor vehicles. And this leaves aside issues such as the energy-wastefulness of repeatedly circling PRT cars, and issues of the impact of these "cycling" cars in their holding patterns on the presumable flood of traffic already on the guideways. Furthermore, the vision which PRT theoreticians concoct approaches the diabolical: Not only would the urban airspace be filled with PRT guideways, plus stations with their entrance and exit tracks, but there would be a veritably incessant flow of little PRT cars moving along these guideways virtually all the time. Why? Because, according to PRT designers, the guideways themselves serve as storage areas for PRT cars that are either waiting for their turn to access on-demand calls in stations, or are simply "on call", waiting to be deployed. As PRT proponent Dr. J. Edward Anderson readily acknowledges, "about one third of the operating vehicles will be empty." Anderson presents a scenario of constantly "recycling empty vehicles", bustling over the network of guideways, waiting to be "recycled" and diverted to passengers waiting in a station. The energy wastage of this bizarre scenario of ever-moving elevated pods is only one of its more troubling elements. Perhaps at least as disturbing is the potential ongoing impact on the tranquillity (not to speak of the mental health) of the urban inhabitants, whose celestial view (what little there is of it) would be constantly disrupted by the busy, incessantly mobile PRT clutter above them. Technical problems and inherent capacity constraints have certainly played a role in dampering past interest in PRT. But possibly even more damaging to the concept has been the issue of cost. Given the extremely light-capacity capability of Personal Rapid Transit, for most planners and engineers grappling with actual PRT projects it has consistently tended to seem unlikely that the ridership on a PRT system could ever justify the high infrastructural cost of the concept. Or, to put this another way: PRT has repeatedly seemed to offer far too little capacity bang for the buck. And that "buck" has consistently been lowballed by PRT marketers and many advocates, such as the enthusing journalists of Popular Science with their "$4 million per two-way mile" cost claim, cited above. And their lowball was hardly near the bottom. Some PRT enthusiasts of the early 1970s were predicting costs as low as $1.5 million per mile. But, alas, reality quickly intervened. The actual high cost of PRT could be illustrated in a number of examples, but perhaps the most dramatic has been the PRT demonstration at West Virginia University at Morgantown, viewed at the time (mid to late 1970s) as the "proof of the pudding" of Personal Rapid Transit, in the words of the Metropolitan magazine article already cited. Originally estimated at $14 million by Prof. Samy E. G. Elias, an engineering professor at WVU and a major advocate of PRT technology, in the end the WVU system, 3.6 miles end-to-end with 8.7 total miles of guideway and 5 stations, cost over $126 million (as of 1979) – about $319 million in 2004 dollars. West Virginia University PRT system at Morgantown: As installation cost soared above promoters' original claims, federal government soured on PRT. While that amounts to only about $89 million per route-mile in 2004 dollars (not too bad for a mostly elevated transit system), it is far more than the bargain-basement prices typically promised by PRT promoters – and it does not include costs (such as real estate acquisition, public environmental mitigation, traffic control, etc.) which would be encountered by rapid transit planners trying to install a system in an urban area rather than a university campus. Moreover, the WVU experience engendered skepticism that such a PRT system with small van-like vehicles and small stations would really provide any sizable capacity in a more demanding environment to justify the relatively heavy investment that seemed to be indicated by the demonstration project. in effect, Morgantown was an ice-water bath for federal enthusiasm for PRT. Fast-forward to the middle to late 1990s. J. Edward Anderson, the USA's leading PRT guru, managed to convince Raytheon, a major military hardware contractor, to buy into his PRT technology (a scheme developed in 1981), which he licensed to Raytheon in 1993. Raytheon then poured R&D money into the concept, bringing forth PRT 2000, a proprietary Personal Rapid Transit product. One way or another, PRT promoters had managed to attract the interest of the Northeastern illinois Regional Transportation Authority (RTA) in the concept, and a study concluded in 1992 that a suburban PRT system appeared feasible. Lured by Raytheon's promise of a 1.3% commission on any additional sales of the PRT 2000 technology, RTA bought heavily into the venture, investing tens of millions of dollars in a proposed PRT system in the Chicago suburb of Rosemont, illinois, where a conference center and hotel complex near the Chicago O'Hare airport were planned. A 3.5-mile (5.6-km) triple-looping layout with about 8 stations and 40 cars, operating 20 hours a day, was intended to feed passengers to the RTA's Blue Line rail transit station (actually, not a bad test application for PRT). The system was projected to attract about 2 million rider-trips a year, at a cost of $1.00 a trip. 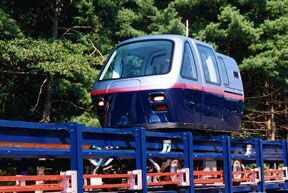 Raytheon PRT 2000 car on Massachusetts test track in 1997. Actual costs quickly exceeded designers' dreams. Raytheon launched into the Rosemont venture with gusto. Raytheon's 1995 Annual Report, for example, enthuses: "Personal Rapid Transit. How can technology offer urban and suburban dwellers the personal convenience of the car without the headaches? 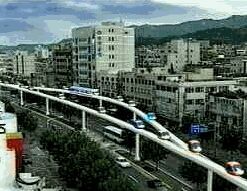 One solution is Personal Rapid Transit (PRT)." PRT has the support of a small number of very bright U.S. engineers and other transport specialists, who say that mass public transit with its large vehicles and many station stops is a hopeless loser in the dispersed decentralized suburbs of modern America. And they say that in the present political climate it has to be able to be financially self-supporting, unlike buses and rail. Raytheon and CRTA have embraced that idea and hope to produce a system costing around $14 million/km [$23 million/mile] to build. Even more important they say it has to offer a high standard of individual service at very low operating cost. But designers were confident they could solve these and other technical challenges. Their computer simulations also optimistically predicted that the whole system could be delivered at bargain-basement prices. As Tauber and Fergione exuberantly declaimed, "Detailed cost estimates repeated in successive stages over a period of six years show that in many reasonable applications PRT 2000(TM) can be built and operated at far lower cost than existing rail transit modes." The hardware development program will prove the performance of PRT 2000(TM) on an oval track with one off-line station and three prototype vehicles at Raytheon's Electronic Systems Division facility in Marlborough Massachusetts USA. The prototype test program is expected to begin in 1996 following which the Rosemont demonstration is planned. Additional deployments in the United States and abroad are being considered in parallel. Reality began to hit about 1998, particularly as it began to appear that costs were soaring far above the initial rosy estimates of $23 million/mile ($14 million/km). RTA was getting decidedly nervous about the escalating costs, which by late 1998 had climbed about 50% above the original per-mile projections. In addition, there may have been other concerns as well (possibly over the running of cars on one another's tails with no safety-braking margin). RTA director Valerie Jarrett, who also chaired the Chicago Transit Authority Board, in late 1998 worried that there were too many "unanswered questions" about the plan. But the cost overruns were the killer, and the RTA put the whole Rosemont project on hold – a lockdown from which it was never to emerge. "Some members of the RTA Board had said they would not approve the plan if it had been presented at last week's regular meeting" reported the UTU Daily News Digest. Valerie Jarrett raised what the UTU described as "substantive questions" about the plan. "The RTA has not done any independent analysis of the ridership projections and financial plan" for the system, she said. In any case, work on PRT 2000 was discontinued by Raytheon and the RTA in 1999 ("Raytheon's PRT 2000", innovative Transportation Technologies website, 18 August 2002). An interview with Raytheon's project manager (ITS international, November/December 1999) notes that the company gave up after realizing that they could not build the system for less than $50 million per mile – and that for single-direction guideway loops. "The RTA has officially pulled the plug on the proposed PRT project (personal rapid transit) in Rosemont" reported The Weekly Breakdown (a Chicago-area "urbanophile" and tech-oriented online newsletter). "This in the face of the increasing costs of the system." Certainly, as a potentially emergent technology, PRT would seem to need to be given an opportunity to prove itself. The prudent method for doing this would seem to be, not adoption for installation as an urban area's full rapid-transit system, but rather a test installation – a demonstration project – in a smaller-scale situation, such as a shopping center, office complex, or feeder to a heavier-capacity transit service. Yet, even attempts at this more modest level of installation – such as the Chicago-area Rosemont project – have failed. Undoubtedly, the leading proponent of PRT in North America is Dr. J. Edward Anderson, at the University of Minnesota (an institution which also apparently has a financial stake in Anderson's technology). Yet it is curious that the U of M has not opted to build even a small publicly accessible and commercially usable demonstration installation of Anderson's SkyWeb (aka Taxi 2000) PRT concept to serve students and faculty on its own campus. Reasons for why these systems were not further developed and implemented are difficult to assess, as no published comprehensive study on this subject has been performed. Some basic reasons though might have centered around technical problems, lack of perceived demand, concerns over cost-effectiveness, shifting transportation and research priorities, lack of government support, and doubts over possible adverse public reaction. · "Small vehicle designs are best suited for low-density travel yet these systems require complicated, electronically-controlled guideways which would be economically feasible only on heavily travelled routes." · "A PRT system would not be able to provide the passenger carrying capacity required for adequate peak-hour performance. The one second and lower headways proposed were shorter than the required braking distances for the vehicles." Dr. Vukan R. Vuchic, an internationally acclaimed transportation professor at the University of Pennsylvania, in his classic textbook Urban Public Transportation (1981), recounts that "PRT systems were one of the most glamorous concepts in transit innovations during the early 1970s." He recalls that numerous articles, reports, symposia, and similar events were focused on development of the Personal Rapid Transit concept. 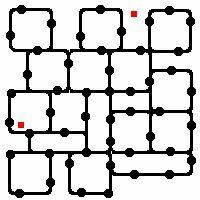 However, he notes, "in spite of all these studies and promotional activities," the PRT mode had not moved any closer to actual implementation, and "for a very simple reason: the basic concept of PRT is inherently unsound." It combines small vehicles, ideal for low-density travel, with complicated, electronically controlled guideways which are feasible only for heavily traveled routes. Thus in suburban areas where a vehicle size for three to six persons would be optimal, construction of guideways is economically infeasible; on major arterials where guideways are justified, the small vehicles cannot provide the required capacity. Consequently, the combination of the two features – small vehicle and complicated guideway – is paradoxical and makes the PRT mode infeasible under all conditions. How is it possible that this infeasible concept attracts so much interest, and even governmental support for development in several countries? The explanation lies in the fact that the positive features of PRT are often exaggerated while the negative ones are overlooked. Thus, although it is true that PRT resembles the positive characteristics of the private auto more than any other transit mode, it is also true that due to this similarity PRT has the severe limitations of auto use in urban areas: low capacity, very high cost and energy consumption per space-km, and extremely large space requirements for stations, guideway interchanges, and vehicle storage areas. PRT proponents seem to be masters at the art of hyping the "sizzle" – hinting at near-miraculous capabilities for their product, bolstered by glitzy computer-generated images of high-tech-looking transpo-gadgets. But it's all in cyberspace! Where is there one, single, operating example, in a real-world, viable, daily urban application, of a single one of the vast array of proprietary Personal Rapid Transit "Gadgetbahnen" being offered? The bottom line is that, after more than four decades of theoretical conceptualization, design, and development, there is still no working, commercially viable, publicly accessible urban installation which actually implements the core PRT concept of automobile-sized vehicles whisking passengers directly from individual origin points to customized, individual destinations. Furthermore, experience with other automated transit systems suggests that the dramatic operating and maintenance cost savings promised by PRT promoters for totally automatic operation will never materialize in reality (see, for example, Transit Automation and Operating Cost – Where Are the Huge Savings?). As previously noted, PRT seems to excel in the theoretical constructs of its designers' computer simulations; but, confronted with the real world, it keeps "going splat". PRT's travails would be of little more than marginal interest in the public transport industry except for the fact that this proprietary, repeatedly failed system is being brandished as a viable "alternative" to proven, workable, reliable rail transit projects – and in effect an excuse to stall bona fide major transit investment programs. it is somewhat astounding that PRT is being seriously considered anywhere when there is no working prototype of this technology in public service, anywhere. Thus, PRT promoters can merely refer to the sanctity of their computer simulations and claim ... virtually anything. in contrast, LRT may lack some of the glamorous gadgetry, but it does offer a long, proven track record as a transit mode that works well, that is affordable and cost-effective, that excites the public and attracts passengers, that has proven its ability to reliably handle large volumes of riders, and that stimulates adjacent transit-oriented development. Planners and decisionmakers need to decide: Which are they going to believe – computer simulations, or the real-world evidence before their own eyes? Some material for this report has been adapted from postings to the Light Rail Progress online discussion list.